“Saints Rest” is a gentle and heartfelt musical drama about two sisters, Joni and Allie (Hani Furstenberg and Allie Trimm), who are in contrast with their ambitions and perspective. Joni owns a coffee shop called Saint’s Rest in their hometown of Grinnell, Iowa. Allie is leaving after a short hiatus for her first role in an Off-Broadway play in New York City. Joni stayed behind to take care of her mother, who had recently died, and has resentment towards her sister for both her lack of presence during the illness and flight from their roots. 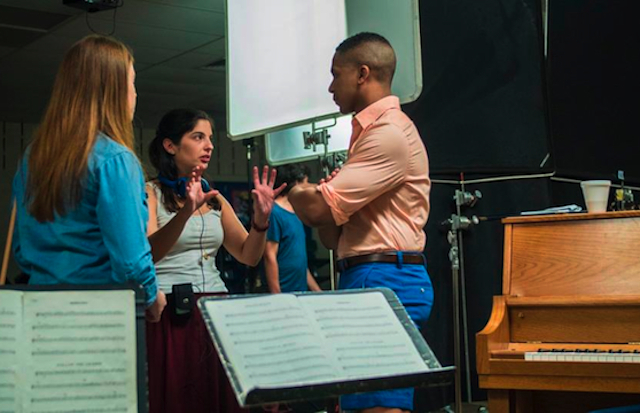 Their connection remains music, and the film features several original compositions that are performed live in the film, and like a musical speaks to the circumstances of the story. The director/co-writer, Noga Ashkenazi, makes her narrative film debut with “Saints Rest,” after studying in Paris and Grinnell College. She learned the nuts and bolts of filmmaking while creating her first work, a documentary called “The Grey Area: Feminism Behind Bars,” which explored women’s issues in the criminal justice system. She set “Saints Rest” in her college hometown, and creates a poignancy, authenticity and familiarity that is ultimately touching. In the following Podtalk Part One, Director Noga Ashkenazi reflects on the themes in “Saints Rest,” and the use of music as a means to communicate emotion. In Part Two, Noga talks about the concept of home, and her learning experience when she began her filmmaking career. The Midwest Independent Film Festival presents the Midwest Premiere of “Saints Rest” on Tuesday, June 5th, 2018 (6pm start), at Landmark Century Centre Cinema, 2828 North Clark Street, Chicago. Director Noga Ashkenazi will make an appearance on behalf of her film. For more information about the festival, click here.